Encore blog: Today is the first day of Spring, 2016. It snowed here and more snow is predicted for tonight. As usual (see below) I tend to put cool weather crops like beets, lettuce and kale, in the ground early. My weather has been so unpredictable here in the Mid-Atlantic for the lasts couple of years but win, lose or draw, I usually just plant. 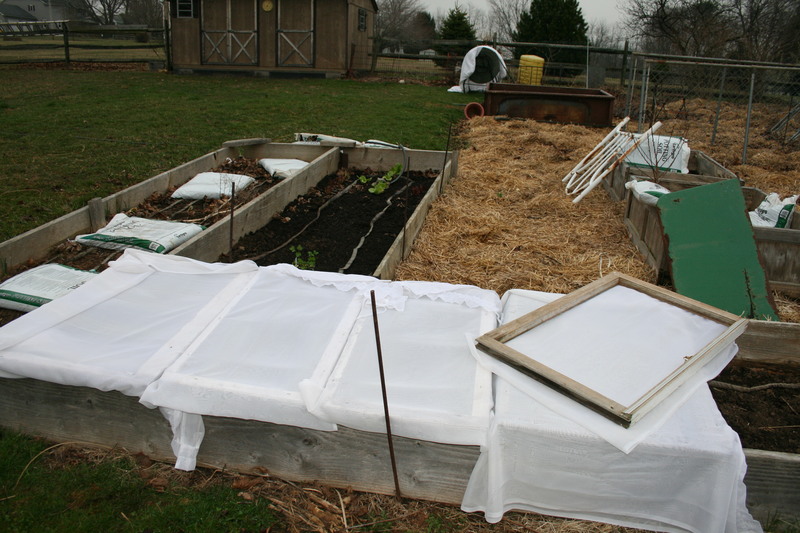 Some tips on getting cool weather crops started and some cheap tips on how to protect them when snow and frost return to their curtain calls. 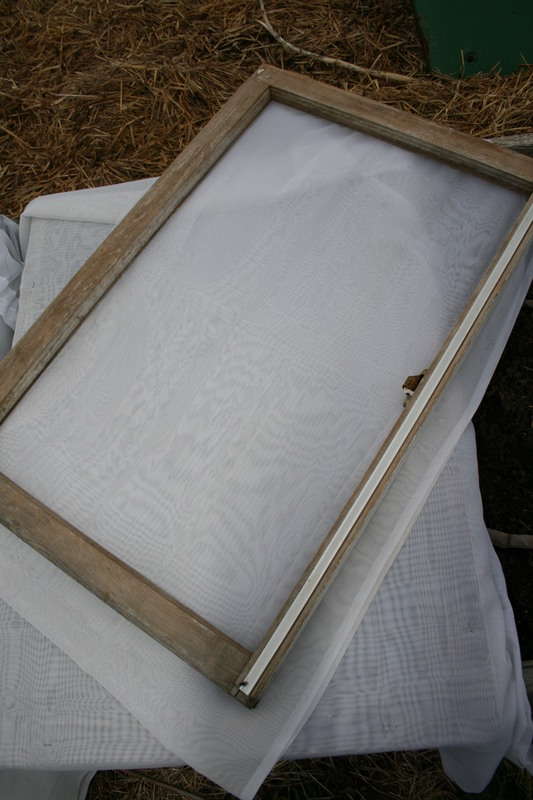 Old sheers stapled to old window frames. It was gray and cool day, perfect weather for the baby plants that I put in the old ’55 Chevy truck bed! All of butterhead lettuce and the spinach slid right into the soil and the plants responded to the cloudy skies and low temperatures beautifully. The oak leaf lettuce (lower left hand side of the picture) didn’t fare as well. It got a bit battered by the wind which rose to 35 miles per hour the day after transplant. Beets started indoors can be transplanted outdoors as soon as you can work the soil — if you protect them from frost. 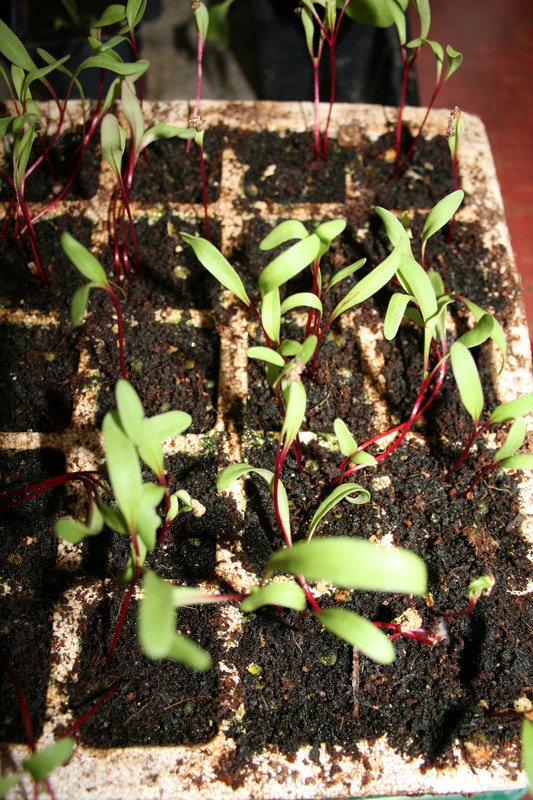 Next to go out, will be the baby beets I started in the basement from seed. I used a 40 cell propagation tray and put 2 or 3 seeds in each cell. When I transplant the beets, I will separate them by gently teasing apart their tiny roots (cilia). Using a pencil, I will punch a hole in the ground and set each beet in, tamping gently around the stem. The kale, which is a mixture of dinosaur, curly and seeds from Adaptiv which came from around the world, will go in on the same day as the beets. And if another frost is in the forecast, it will be easy to protect all these small plants using materials I got for free. The old window frames came from a friend’s house. The sheer curtains came from my own living room. Both were being replaced and could have been thrown out but I saw opportunity. I knocked out the glass and cleaned the frames up a bit. Then I stapled the curtains to the window frames. In 20 minutes I made half a dozen “raised bed” covers. 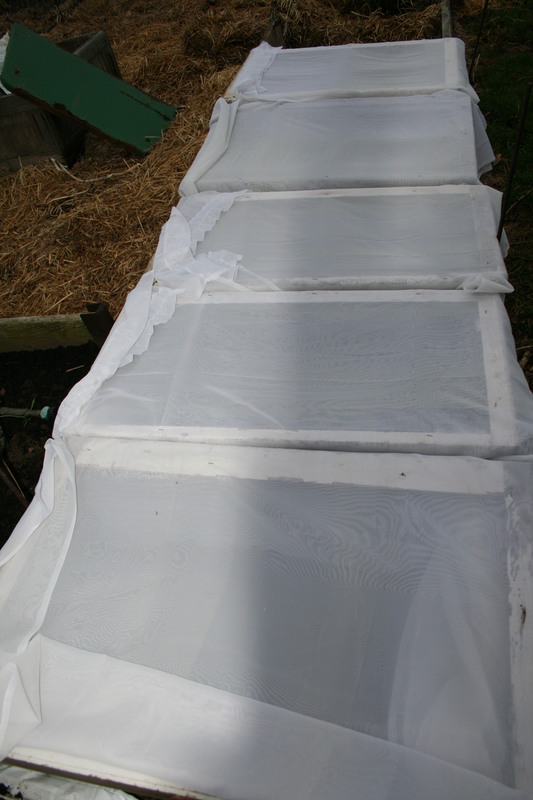 These covers can be used year after year and make protecting transplants easy. Just make sure your raised beds are the same width as the length of the windows so you can use the sides of the beds to prop up your covers – just lay them across the raised bed and…instant coverage. Are your transplants in the ground yet? Are you getting ready to harvest? Share the state of your garden and any tips you have for getting plants into the ground! 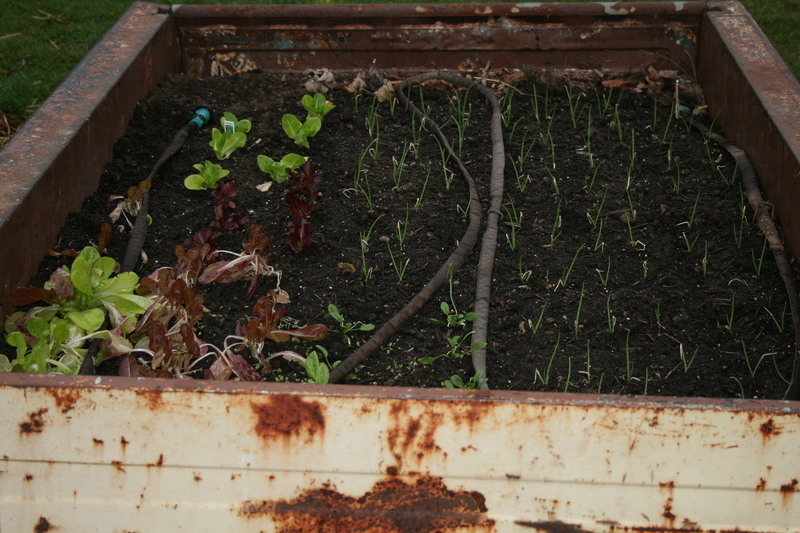 This entry was posted in Gardening Tips, Organic Gardening, Seeds & Seed Starting, Tools for the Organic Gardener and tagged Beets, butterhead lettuce, frost protection, how to protect plants from frost, kale, raised bed, sheer curtains, window frames. Bookmark the permalink. Thanks for the pingback! Love spreading the word about organic gardening and glad you liked the post! Spring is such a wonderful time of the year! !